What if you could see a speeding bullet in the milliseconds it exits the muzzle of a pistol? How cool would that be… Well, the Mythbusters folks (Adam Savage and Jamie Hyneman) have made that possible. Using an exotic Phantom super-high-speed camera running at 73,000 frames per second, the Mythbusters recorded a .45 ACP bullet being fired from a 1911-type handgun. What unfolds is spectacular. First you see a ball of flame as the bullet emerges from the barrel of the 1911, then two distinct, separate swirling clouds form as the bullet races toward the target. Watch the video a couple times — it’s mesmerizing. Co-host Adam Savage is nearly rendered speechless by the remarkable slow-motion footage from the Phantom. Filmed at 73,000 frames per second, the video reveals a dance of pressure and fire that would otherwise be missed by the unaided eye. Share the post "Mythbusters Film Pistol Shot at 73,000 Frames Per Second"
This video from Brownells talks about a the crown of a barrel and how the crown’s condition affects accuracy. As the bullet leaves the barrel of the gun, the shape, alignment and the condition of the crown can affect the accuracy of your shot. A proper crown is essential to ensure that the bullet leaves the barrel correctly and that the propellant gasses behind the bullet are distributed evenly on firing. A square crown without burrs and a smooth transition will normally ensure consistency from shot to shot. By contrast, a damaged crown can cause unpredictable flyers that open your group. 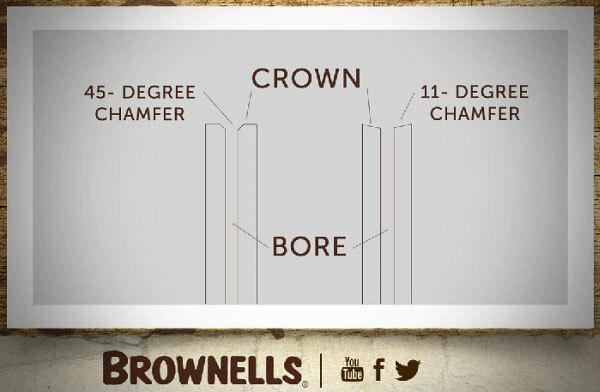 That’s why it’s important to have perfect crowns on all your barrels. The video explains the different types of crowns that can be used. In addition, the video shows how you can chamfer your muzzle in a home shop. If you use a properly-sized pilot, cutting a shallow chamfer is something that most guys with some mechanical skill can handle. Just be sure to use lubricant, flush chips, and don’t rush the job. Cutting the barrel is another matter. At the 1:20 mark the video shows how to use a hack-saw to remove a damaged muzzle section. While this may be fine for an inexpensive rifle that needs a “quick fix”, we do NOT recommend using a hack-saw with a vise for a competition barrel. The reason is that it is too easy for a novice to produce a cut that is not square. We suggest letting a professional gunsmith cut and crown your competition barrels. Share the post "Brownells Video Shows How to Cut Chamfer on Barrel Crown"
In our Shooters’ Forum, there was an discussion about a range that was threatened with closure because rifle over-shoots were hitting a farm building over two miles from the firing line. One reader was skeptical of this, asking “how’s that possible — were these guys aiming at the stars?” Actually, you may be surprised. It doesn’t take much up-angle on a rifle to have a bullet land miles down-range. That’s why it’s so important that hunters and target shooters always orient their barrels in a safe direction (and angle). Shooters may not realize how much a small tilt of the barrel (above horizontal) can alter a bullet’s trajectory. How many degrees of muzzle elevation do you think it would take to hit a barn at 3000 yards? Ten Degrees? Twenty Degrees? Actually the answer is much less — for a typical hunting cartridge, five to seven degrees of up-angle on the rifle is enough to create a trajectory that will have your bullet impacting at 3000 yards — that’s 1.7 miles away! Five degrees isn’t much at all. Look at the diagram below. The angle actually displayed for the up-tilted rifle is a true 5.07 degrees (above horizontal). Using JBM Ballistics, we calculated 5.07° as the angle that would produce a 3000-yard impact with a 185gr .30-caliber bullet launched at 2850 fps MV. That would be a moderate “book load” for a .300 Win Mag deer rifle. Here’s how we derived the angle value. Using Litz-derived BCs for a 185gr Berger Hunting VLD launched at 2850 fps, the drop at 3000 yards is 304.1 MOA (Minutes of Angle), assuming a 100-yard zero. This was calculated using a G7 BC with the JBM Ballistics Program. There are 60 MOA for each 1 degree of Angle. Thus, 304.1 MOA equals 5.068 degrees. So, that means that if you tilt up your muzzle just slightly over five degrees, your 185gr bullet (2850 fps MV) will impact 3000 yards down-range. If the bullet travels slower, or if you shoot a bullet with a lower BC, the angle elevation required for a 3000-yard impact goes up, but the principle is the same. Let’s say you have a 168gr HPBT MatchKing launched at 2750 fps MV from a .308 Winchester. (That’s a typical tactical load.) With a 100-yard zero, the total drop is 440.1 MOA, or 7.335 degrees. That’s more up-tilt than our example above, but seven degrees is still not that much, when you consider how a rifle might be handled during a negligent discharge. Think about a hunter getting into position for a prone shot. If careless, he could easily touch off the trigger with a muzzle up-angle of 10 degrees or more. Even when shooting from the bench, there is the possibility of discharging a rifle before the gun is leveled, sending the shot over the berm and, potentially, thousands of yards down-range. Hopefully this article has shown folks that a very small amount of barrel elevation can make a huge difference in your bullet’s trajectory, and where it eventually lands. Nobody wants to put holes in a distant neighbor’s house, or worse yet, have the shot cause injury. Let’s go back to our original example of a 185gr bullet with a MV of 2850 fps. According to JBM, this projectile will still be traveling 687 fps at 3000 yards, with 193.7 ft/lbs of retained energy at that distance. That’s more than enough energy to be deadly. Share the post "Over-Shooting the Berm — When a Mere 5 Degrees Can Be Deadly"
Muzzle brakes are controversial. Some people swear by them, while others swear at them. Still, there’s no question that a good brake can reduce felt recoil up to 45%. And likewise, the best brakes, when installed properly, seem to have no negative effect on accuracy. “In my tests, not having holes all around the brake effects accuracy a bit. I believe it does something to the bullet by the air pushed ahead of the bullet creating unequal turbulence in the bullet path. I’ve tried a few brakes where I drilled only holes on the top, test fired, and then completed holes on the bottom and in every case, accuracy improved.” Below are spiral-ported brakes crafted by Clay Spencer. Roy’s findings are fascinating and suggest that further study of muzzle brakes is warranted. But we can all agree that precision installation of the brake is essential for accuracy. A poorly-installed, mis-aligned brake will degrade accuracy, that is well-known. Share the post "Muzzle Brake Performance Tests by Bertalotto"
There are compact, standard, and large size Vektor muzzle brakes. Adjustment and installation is the same for all three sizes. The small, compact model, with two rows of opposed horizontal ports, is designed for .223-caliber rifles. The medium (standard) size, with either double or triple sets of opposed ports, is suited for 6.5mm or .308 calibers. The largest size, with three rows of large ports, is configured for the .338 magnum calibers. Skorpen claims that all three sizes of Vektor brakes can reduce felt recoil by 70% to 80% The brake itself is SIS1914-04 steel with an oiled zinc phosphate finish. 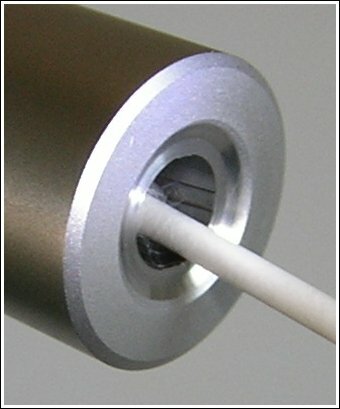 The internal socket is AISI 303 (SUS 303) stainless steel. If your barrel is already threaded at the muzzle, the Vektor brakes can be installed with no metal-work or gunsmithing required. Otherwise, you will need a gunsmith to thread the muzzle end of the barrel. The Vector bushings can be machined to a variety of thread types: 1/2″-20/UNF, 1/2″-28, 5/8″-18/UNF, 5/8″-24, m14x1, m14x1.5, m15x1, m16x1, m17x1, and m18x1. Just indicate the thread pitch you require when ordering. Skorpen’s company, Vertebrae Sikkerhet & Teknikk, exports these Vektor brakes at reasonable prices. With one (1) supplied bushing, the compact brake is $131.43 USD, standard brake is $167.64 USD, and the large (magnum) brake costs $198.49 USD. Extra bushings are available for around $20.00. While the website lists .223, 6.5mm, .308, and .338 caliber brakes, Vetebrae can produce brakes in other calibers on request (add 5 days to delivery time). You can also purchase Vektor muzzle brakes by emailing joachim [at] vertebrae.no. (It may be cheaper to order direct via email.) Just send an email stating your desired caliber and thread pitch. Normal delivery time to the USA is one to two weeks. Share the post "Vektor Muzzle Brakes From Norway Install Without Gunsmithing"